Industrial park “Green wood” – is a scale regional project on the attraction of investments, advanced scientific and industrial technologies. Project’s participants: the Government of the Oryol region, the Administration of the Mtsensk district. – processing of agricultural production and others. Industrial park “Green wood” is situated in the north-east of the Oryol region in Mtsensk district. Its area is 140,5 Ha. The territory of the Industrial park directly abuts to the Federal Highway M2 “Crimea” from Moscow through Tula, Oryol, Kursk, Belgorod to Kharkov, Dnepropetrovsk, Simferopol (European highway E105). Dangerous natural and man-made processes are absent on the territory of the Industrial park. There is a railroad highway Oryol – Moscow parallel to the highway M2. According to the Industrial park concept the zoning of the territory for 12 industrial sets will be provided, there will be also a rest zone, a service zone, a sport zone, a trade zone and subsidiary zones for infrastructure facilities location. Potential residents will be provided with the opportunity of building of industrial, research, administrative and warehouse facilities on the prepared land sites of industrial purpose. – full package of measures of investors state support, provided by regional legislation, including tax benefits, the subsidy of interest rate on loans, attracted for investment projects realization. 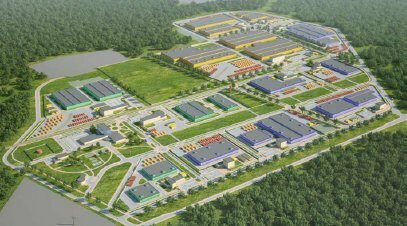 The land sites are the privacy of the only Management Company JSC ‘The directorate of the industrial parks of the Oryol region”. According to it, the state provides “clarity” and transparency of all legal procedures, connected with the transfer of the ownership. – consulting services on the attraction of profile working human resources. Download Industrial park “Green Wood” summary information. Download full presentation of the Industrial park “Green Wood”.